Well now, it's official. Machete will begin filming in June. Trejo and Rodriguez will co-direct. "Written by Rodriguez, Machete will star Trejo as a Mexican ex-Federale, who while posing as a day laborer is double-crossed by a corrupt state senator, and uses his proficiency with bladed weapons, and apparently a gatling gun, to get revenge." There is no word on whether Cheech Marin will be in the film, but if you look at the Cheech & Chong: Light Up America tour schedule, there's a 2 month gap beginning in June. They also converted a '67 Chevy Camaro for Anthony Kiedis. Unseen TV interviewed Cheech & Chong backstage in Sydney. May 28 "Cheech & Chong: Light Up America" show at Waikiki Shell. From 10 a.m. to 10 p.m., all tickets are $20. Log on to www.ticketmaster.com and use the password 420. We're still trying to find out why and for how long, but the Up in Smoke Soundtrack CD has been discontinued by Warner Records. Cheech & Chong's Wedding Album is also not available for order from Warner. We have a limited quantity on-hand so we recommend buying them just in case Warner decides to never print them again. If Warner decides to make them only available in mp3 format, these may become collectors items. Cheech & Chong, who are currently in Australia, did a meet-and-greet at JB Hi-Fi. It was part of Record Store Day in Australia. Many other Australian celebrities also participated in the event. Today, Australia's Undercover had a chance to interview Cheech & Chong at The Palais in Melbourne Australia. We've been reading that a number of Aussies are getting busted outside the Cheech & Chong: Light Up Australia shows. In fact, yesterday's show at the Enmore Theatre in Sydney had to be delayed while the police carried out searches with drug sniffer dogs. Six people were busted (they just received a warning) for possessing a small amount of cannabis. ModernFilmZine interviewed Tommy Chong about the Cheech and Chong animated movie they're working on. Bits from the old Cheech & Chong albums will be put together and animated to create a story. It's being directed by Eric and Branden Chambers, of Chambers Bros. Entertainment. Tommy Chong says he and Cheech are like "quality control" for the project. He also said there will be additional animated films using their albums. 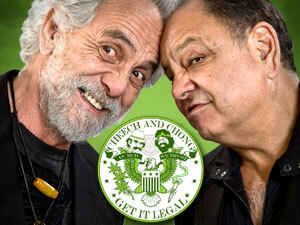 The Cheech & Chong: Light Up America tour is coming to Saratoga, CA. Pre-sale: April 22nd, 10AM local time. Public-sale: April 26th at 10AM. Cheech & Chong will be at JB Hi-Fi in Melbourne next Saturday, April 18, for Record Store Day Australia. Record Store Day Australia is a day when stores all over Australia join together for a national day of artist appearances, signing and special events. Cheech & Chong will be doing a meet-and-greet. Tommy Chong told Australia's Undercover that after the comedy tour is over, they plan on filming two movies and then settling in Vegas. They'll perform a few shows each weekend and then go back to their homes in Los Angeles. The movie deals are still being worked out. Cheech & Chong and other celebrities (Bon Jovi, Jimmy Fallon and more) will be in an upcoming special on New York's The Beacon Theatre. It premieres on MSG April 9th at 10PM New York. Size Large of the Vintage Poster t-shirt is back in stock. This is our best-selling shirt ever. It's beautiful. We have sizes S, M and L.
Sorry, we won't be receiving any larger sizes. These run a little big so L should fit an XL person. During an interview with the Charlotte Observer, Cheech says he's working on a new book. He didn't reveal the subject of the book, but he's previously written a collection of children books, an autobiography and a book on Chicano art. Maybe, it will be his version of Cheech & Chong: The Unauthorized Autobiography. We don't know. Cheech also said he'd like Robert Rodriguez (Grindhouse, From Dusk til Dawn) to direct a new Cheech & Chong film. Tommy jokingly said, "I want to write a kid's book because Cheech did one. I want to write one that's more popular." Cheech & Chong will be performing in Charlotte tomorrow night.